This cake I made from three parts. The cake itself, buttercream frosting and fondant that I made from scratch myself. None of these were overly strenuous. I am an amateur cake maker in my own right and did this on a whim for my godson's second birthday. Simply by combining a little creativity and a bit of online research I was able to pull off this wonderful cake. I might add that nobody wanted to be the one to cut into it. The four figures (Mickey, Minnie, Pluto and O'tooles) I borrowed from my godson for decoration. Absolutely everything else on this cake was edible. I started out by making two batches of marshmallow fondant from a recipe I found online. By simply melting marshmallows and kneading confectioners sugar into the mixture, I opened a whole new gateway of creativity. Believe it or not this was my first time attempting this recipe. I separated the fondant into several different sections and started to knead the coloring into each (red, yellow, blue, black and grey). Then I simply went to town, or Mickey's Clubhouse, and started to create all the different aspects of the clubhouse. The head, hand, foot, slide, table, fence and little stone pathway. It was very much like playing with playdough and quite a bit of fun. All of these I let sit over night to set up a bit. I then made a chocolate sheet cake as well as a confetti dome cake for the base of the main part of the clubhouse. When the cakes were completely cooled. I covered them with green buttercream frosting. I used a thin layer of buttercream on the dome cake to allow the red fondant to stick properly before attaching it to the sheet cake. From here I just started to assemble all the pieces to the cake. I used a simple flower tip to pipe bushes and then added mini M&M's (my godson's favorite candy) as flowers. With a dusting of green sprinkles on the grass and the figurines in place, the cake was complete. By the way, here is the website for the fondant recipe. It was extremely useful and I am forever grateful to Peggy. Other great pages you don't want to miss! beautiful cake and i think its delicious too! very good cake and cute too!! This is a very good place to learn about cakes. Cakes in the shape of Mickey Mouse is an amazing idea. Everyone know that making such cakes is very difficult. I found a hug collection of cakes designs as well. I hope everyone must happy to find this site. any how, i need essay writer services and at the same time love to eat cakes and this site have amazing collection of cakes. Been a good time reading the posts here. Good stuff. Very amazing cake. I would like to know the secrete behind this cake making. I used to make cakes for the birthday of my family members. But the cake made by you is amazing and tell me the process. I am very much interested to know. To get dragon city cheats and enjoy this game. Din hija website sbieħ ħafna u jżommu l-ħidma tajba. Din hija website kbir u nixtieq ngħid li dan huwa disinn website kbir. Jkomplu jaħdmu iebes. I want to know how much this cake cost please email me to this email add aneb09@yahoo.com. you've done a great job on the cake! wow great job i wish i can do that for my daughter for here 3bay coming soon . All I can say is BRILLIANT!!!! You done a great job and it looks great, you have got a great talent for cakes. I am no way that talented so have to buy my Mickey cake from my local ASDA store, Shame I don t live nearer to you, as I would of been asking you to make my Little boys cake for him..
i love your cake desing i love mickey mouse and disney world well done. Would you consider making me a duplicate or close to it for my daughters birthday? What would you charge? Where are you located? Cake looks great! Do you make cakes to sell? Would you consider it? If so, maybe we can talk. 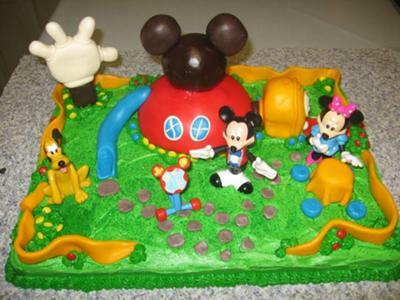 LOVE your cake, I am going to attempt to make it for my daughters 2 birthday this Saturday and am wondering how you got the ears to stick so good the the head of Mickey And the Hand so good to the black underneath? DId you have to use any pins or anything? And when you left it to dry you didn't put the actual pieces for the cake into the fridge right? only the dough you had leftover? Hi I am making a Mickey Mouse clubhouse cake for my daughter's second birthday. I know you got the figurines from the birthday boy, but do you have any clue where they got the tootles, I am on a major hunt down for him, I have all the other clubhouse people but tootles. Any help at all would be much appreciated. I have been a cake decorator for several years and I love this design. I want to make this for a friend of mine this weekend, but I can't sigure out how you got the hand to stand straight up. I am using regualr fondant is that the problem? I am very excited to try and make this cake my kids for their joint birthday. I have never attempted to make a cake form scratch so I am a little nervous and I am not sure how you made the little confetti dome cake part. Also do you let the fondant stay out on the counter to harden over night or do you put it int the fridge?As for the black coloring is there a black food coloring or do you have to mix colors for that? My son wants a Micky Mouse cake for his 3rd birthday. You have inspired me to make one with fondant (I was always afraid of it before) even though I have experience with cakes (made all my sisters wedding cakes and various others). I had a question though. Did you make the glove and shoe in all fondant or is there cake under there too? daughters 1st birthday cake. Keep decorating looks like you really have a knack for it.